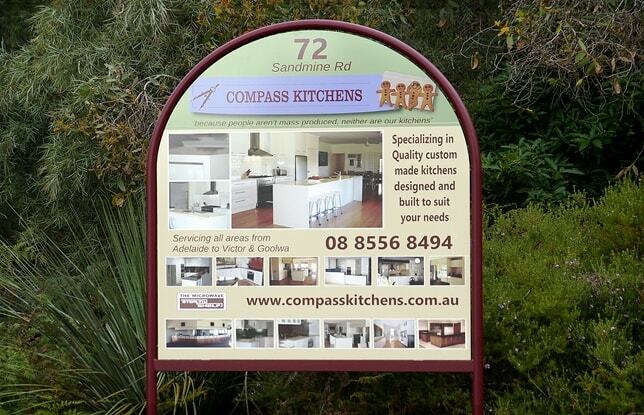 Kitchen Renovation with Federation Shaker Panels & Granite Benchtops. Our clients beautiful home is situated in the picturesque Adelaide Hills where it was built Circa 1895 using the local Flint and Daub in its construction. 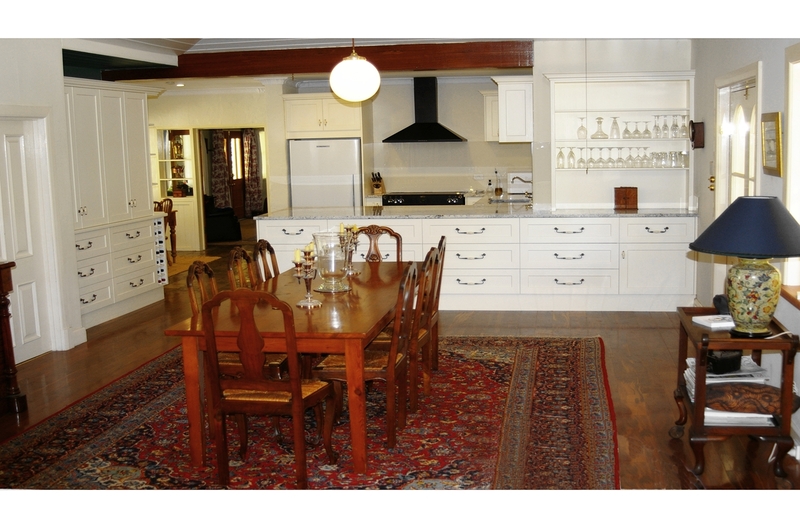 This was the third home that we have helped renovate for these clients where now for this latest Federation Style Kitchen Renovation our clients selected White Fantasy Granite Benchtops to provide them with a generous unencumbered preparation and entertaining space. In keeping with the style of their home they chose to use our Traditional Hand-Painted Federation finish for their Shaker Doors, Drawers and Panels; where this traditional finish provides a very resilient, hard wearing surface that is easy to care for, easy to repair if damaged, while providing an authentic finish that fully compliments the style of this home and its other existing Decor and Period Furnishings. For this Kitchen our client opted for a Double Square-line Undermount Stainless Steel Sink while pairing this with a Perrin & Rowe Aquitaine tap in the Georgian Style. 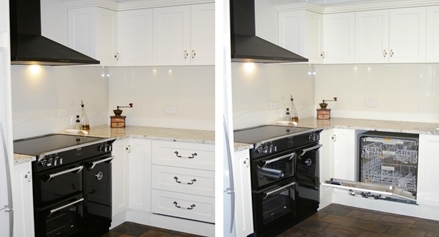 They also selected a Black 1200mm wide Belling Electric Range Oven and matched this with a Black Canopy Hood. 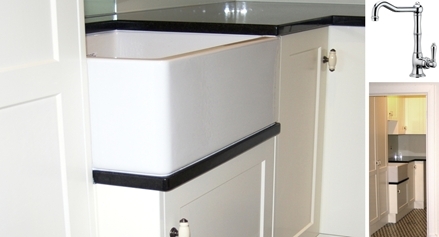 We concealed their Miele Fully Integrated Dishwasher, using three Shaker Drawer panels. Their Storage design was optimized with our Custom Made Cabinets where we introduced Drawer storage where ever practical; whereby making 24 of our custom Wooden Drawers in total. All these Drawers have concealed top quality full-extension Blum Runners, which also have the Soft-close function for full access and smooth operation. 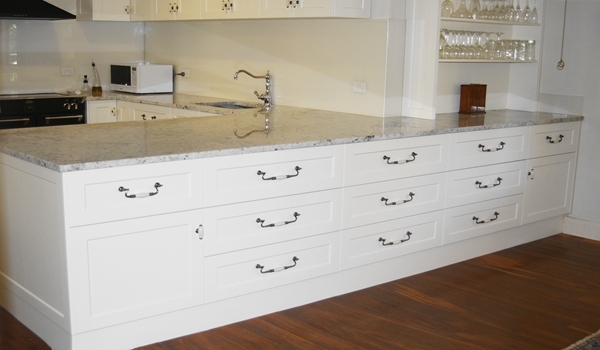 We complemented this style by dressing this kitchen with Quality cream porcelain T knobs on the doors and matching Drop Handles for the Drawers which have Pewter mounts that tie into the surrounding steel finishes. 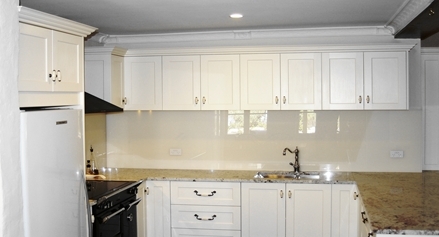 To finish off this Kitchen our clients also chose to use easy to care for, streamlined Opti-Clear Glass Splashbacks in a matching Warm White by Dulux. Our Client has also now kindly asked us back to complete for them another project; where we have now renovated their main Bathroom and adjoining Laundry. For these rooms we have again designed the cabinetry around how our clients use this space and have created a multi-functional bathroom Vanity / Laundry space which has lots of dedicated Storage while also providing the additional useful counter space needed. 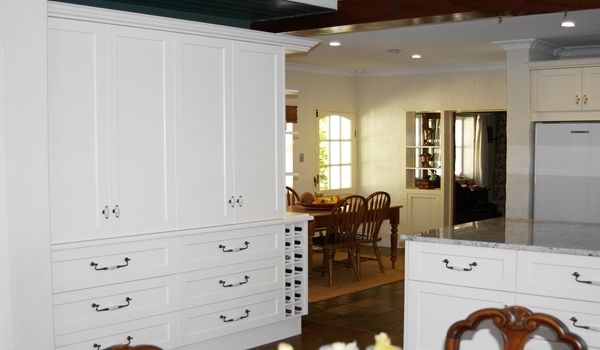 We have made this cabinetry in the Hand Painted Shaker Style, matching these to the Kitchen cabinetry and the large Pantry Tall Boy units that we had made for them earlier. 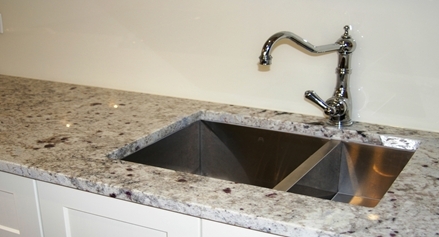 For these rooms we have incorporated a versatile and functional Belfast Sink in keeping with this Federation style and paired this with a Georgian Style Nicolazzi Sink Mixer. In the design we added built-in LED Task Lighting for use as both Vanity and Laundry and incorporated Mirror Splashback here as well for not only just Vanity use, but to increase the sense of space and further enhance the lighting in these rooms. For this Vanity / Laundry space our clients once again opted to use resilient Granite Benchtops, whereby also adding a touch of elegance. For their granite this time they selected a contrasting Black Pearl Granite, which also perfectly complements their new Black & White wall and floor tiles.